Party-Time Man every Saturday 3 till 7pm WDAR-FM SUNNY 105.5 for over 25 years. 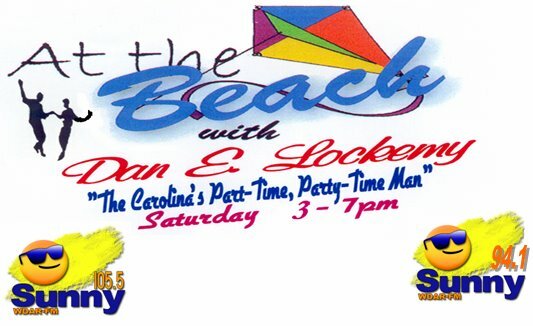 “AT THE BEACH” with Dan E. Lockemy, the Pee Dee’s #1 Beach, Boogie and Shaggin’ Thro-Down Show for over 25 years. Proudly highlighting the Fantastic Shakers and the FANTASTIC “Shakin’ The Shack” beach tunes they’ve created each Saturday afternoon for over a quarter century. Thanks for making “AT THE BEACH” the best place to be every Saturday in the Pee Dee. My “Trash Cans” filled with Carolina Beach Music runneth over because of this great beach and party band!!! This entry was tagged sponsore news. Bookmark the permalink.